Following a week of deadly clashes with protesters, Ukrainian President Viktor Yanukovych and his administration abandoned government buildings in Kiev on Saturday. After fleeing the city, the embattled president accused the opposition a coup and likened the situation to the rise of the Nazi party. “The events witnessed by our country and the whole world are an example of a coup d’état,” he said. Yanukovych left Kiev for the eastern part of the country on Saturday morning, leaving both his presidential offices and residence empty. Reuters reported anti-government protesters had entered the offices saying they would guard them for the next president. In the wake of the morning’s events, Ukraine’s parliament voted to remove Yanukovych from his post and declaring him unable to perform his duties. The president has said he will not resign, but the country’s legislators have set an election date for May 25. “They are trying to scare me. I have no intention to leave the country. I am not going to resign, I’m the legitimately elected president,” Yanukovych said in a statement on television. The Polish Foreign Minister Radoslaw Sikorski took to Twitter to say a coup had not taken place and that the election of a new speaker of parliament had been legal. No coup in Kiev. Gov. buildings got abandoned. Speaker of Rada elected legally. Pres. VYanukovych has 24h to sign 04 Const. into law. Russia’s Foreign Minister Sergey Lavrov criticized the opposition in Ukraine for not meeting its obligations in a peace deal signed with the government on Friday. 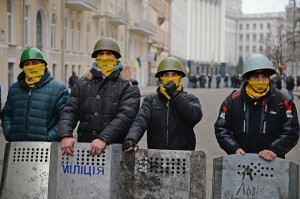 As the situation continued to unfold in Kiev, former Prime Minister Yulia Tymoshenko was reportedly released from prison. A deal for Tymoshenko’s release was brokered this week. She had been imprisoned in the eastern city of Kharkiv for two and a half years. Left: Anti-government protesters stand outside the presidential offices after Yanukovych and his administration left Kiev on Saturday.